Kevin McGuire of Macho Row and several other places returns to talk Nats – Phillies. WFY: This Q&A is different than I anticipated when I started drafting it in the offseason. While I figured Philly would be basking in the glory of the Iggles, I didn’t think the Phillies would be higher in the NL East than the Nats. What’s going right for them? KMc: Honestly, I’m surprised by that development as well. I haven’t been paying close enough attention to say what’s wrong with the Nationals, but I will say the Phillies have become a bi more disciplined with their at-bats than in previous years. They’ll still rack up some strikeouts, but they aren’t exactly going down embarrassing themselves as often at the plate. The starting pitching has been fueled by Aaron Nola and Jake Arrieta early on, which has probably been the most expected part of the season so far. WFY: Gabe Kapler initially looked like such an easy target and his first week wasn’t good. Now, though he’s got the Phillies doing well in a suddenly competitive NL east. He also didn’t have any camels at spring training. How has he done? KMc: While Gabe Kapler still has plenty of room for improvement with some of his in-game decision-making, he has already shown to be capable of learning on the job. His first week was rough and deserving of criticism for a handful of reasons. But since then, things have calmed down a bit with his decisions. He has trusted Aaron Nola more and more since the season opener, but he is still running into a few hurdles with the shift at times. I think the most important thing Kapler has done is not panic. Things did not go well in his first week as a big league manager, but he remained calm and focused on the bigger picture of the season. Because of that, questions inside the clubhouse may have been asked, but he didn’t lose it as soon as possible either. WFY: Rhys Hoskins appears to have avoided becoming the Kevin Maas of the Schuykill. Small sample sizes and all, but it appears he’s changed his approach to hit more for average. KMc: When Hoskins came on the scene last season, Phillies fans probably got a little greedy expecting him to hit home run after home run. He can still hit for power, but I think there was a little bit of a focus on helping the young player realize that’s not going to happen every time he steps to the plate. I’m not sure if there was a specific focus to improve his ability to hit for average, because that may have always been in him anyway. But I think it’s good to see Hoskins not trying to swing for the fences every time after the brief flash of lightning he showed late last season. WFY: Scott Kingery and the Phillies took a gamble with a long-term contract. Early returns aren’t great production-wise, are you concerned? KMc: I’m not concerned with anything just yet because he is so young and he sounds composed like a veteran when he addresses his performance. Mentally, I think Kingery is capable of going through the growing pains, and I’m willing to see if that pays off in the long run. The Phillies did take quite a gamble with the early contract, but everything he has shown in the farm system and in spring training validated the gamble. For a while, he has been viewed as a long-term piece to the puzzle, and now he just has to adjust to the next level. I’ll put it this way. I think there is a better chance Kingery lasts with the Phillies than Domonic Brown. WFY: How is the Aaron Nola, Jake Arrieta led-rotation coming together? The rotation is a bit weird because Arrieta got a later start to the season so the Phillies haven’t lined up the two to go back-to-back just yet, but having the two a little spread out may serve them well to increase the chance of a prolonged losing streak. We’ll see 25-year old Nick Pivetta in the weekend series opener. Pivetta has struggled in three games against the Braves but has pitched well in his other starts and shows signs of growth from last season. Vince Velasquez is slated for Saturday, and he is already starting to feel some pressure to figure things out on the mound. He continues to be a mystery and may be the next starting pitcher to be replaced in the rotation. The Phillies also have two starters on the DL right now with Ben Lively and Jerad Eickoff unavailable. Eickoff may be coming back soon, which should help the rotation. Until then, it’s up to Nola and Arrieta to provide the consistency on the mound. WFY: The elephant in the room (is that a mixed-metaphor in Connie Mack’s old hometown?) is of course Bryce Harper. There is a perception that the Phillies are lining up to make a run at him. The right field dimensions are inviting too. What else makes the Phillies an attractive destination? KMc: That certainly would be interesting to see, although there are probably more Phillies fans hoping they can lure Mike Trout back to the area. I’m greedy though, and I want both. Why not?! The other name floating around has been Manny Machado, who may be the more realistic of the three players to suit up in a Phillies uniform (if any of them come at all). Either way, Trout or Harper would be a smash hit in Philly. The money will be available to make a serious pitch to Harper, and I suspect the Phillies will be ready to make that sales pitch when the time comes. If the Phillies appear to be ready to make a push into the postseason, that would certainly help (and if the Nationals can’t get out of the first round, that may provide more incentive as well). In the meantime, we’ll focus our energy on bringing LeBron James to the Sixers this summer, and then tackle the Harper/Trout/Machado pursuit later on. WFY: Does anybody up there think there a Nats-Phillies rivalry? DC fans certainly weren’t real fond the nearest Northeast Corridor neighbors, but the two teams went opposite directions in the standings abruptly, so this didn’t develop like I expected. KMc: There is a hint of it still left over from the Jayson Werth fallout, and it’s definitely fun to go after Bryce Harper, but that may be the extent of things right now. And like you said, these two teams just have not been on the same level at the same time since the Expos moved to D.C. The Phillies were on top while the Nationals were struggling and in more recent years it has been just the opposite. If things are ever going to heat up though, maybe it will be this year as both teams look capable of being in the playoff discussion by the time September rolls around, whether for the division or just a wild card spot. And if things are tight between the two teams, expect more focus on that Harper situation to pick up some momentum. WFY: It’s a small sample size, but it seemed like last summer I saw the least amount of Phillies stuff in Avalon/Stone Harbor since I started going back there in 2005. Has enthusiasm bottomed out? Is it coming back yet? KMc: I believe it. And get ready for even less this year with the Eagles coming off the Super Bowl (and we’ll see where this playoff run ends for the Sixers). I think a lot of that has to do with the Phillies just not being a good baseball team and one not really worth watching on a regular basis. With the team in a rebuilding mode, the visible fan support will take time to show again with the flags on the beach houses. The Phillies were 20 game out of first place in the NL East and 27 games out of the NL wild card on July 1 last year. When that happens, not many people at the shore are going to be talking about the team while in line at Springer’s. WFY: It seems whenever the Phillies haven’t been in contention, the Michael Jack Schmidt era uniforms get a lot of love. Why is their so much love for those very dated uniforms when the current set are arguably the most successful? KMc: Well, the first World Series was won in those uniforms, so they have developed a bit of a sentimental feel to them perhaps. Maybe it’s the Phillies “P” with the baseball in the center that drives the nostalgia home (I honestly like the 70s-80s “P” to the current one, for example). For some reason, the retro looks just have a way of sticking with Philly fans, like the Eagles and the Kelly green, the Sixers going with a more retro feel with their current uniforms, and the Flyers… well… not too much has ever changed for them. This year the Phillies have started wearing their throwback road uniforms at home. I wasn’t a fan of the idea of seeing the powder blue road unit at home, but I just can’t help but love seeing them now. WFY: Is there a race between a cheesesteak, roast pork sandwich, hoagie and pretzel yet? I guess they’d need Wooter Ice too. KMc: When you have the best mascot in sports, you don’t have to resort to such gimmicks. But, since you brought it up, if the Phillies ever did do some sort of race like the Nationals have (an the Pirates), I think you hit it right on the head with the hoagie, cheesesteak, and pretzel. I might lean more toward scrapple for the fourth contestant. WFY: I saw that the Phillie Phantic is A MAN, HE’S 40. What’s your favorite Phanatic memory? KMc: As long as I have been going to Phillies games, I still look forward to the Phanatic’s daily dance on the bullpen and his on-the-field skits. I know most of the skits by now because you see them often the more games you attend. 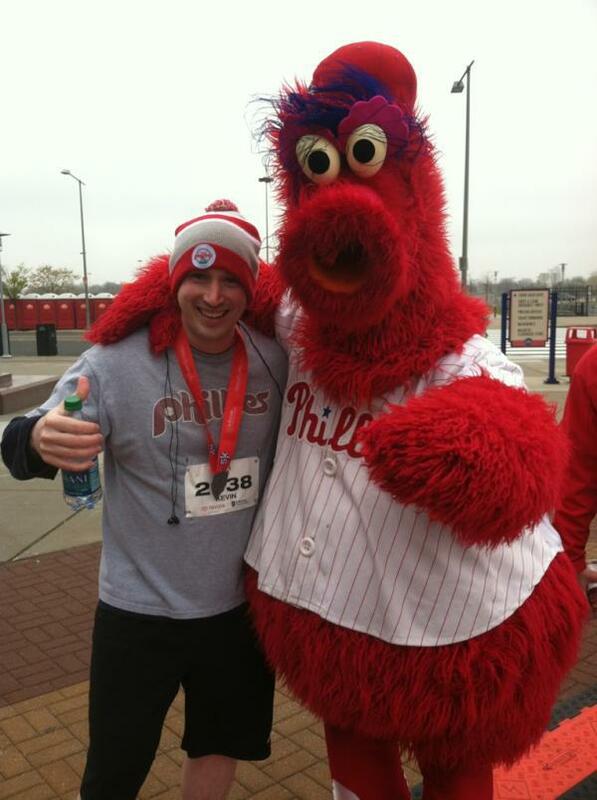 But for me, I’ll always remember when the Phillies tried making the red Phanatic a thing for their season-opening campaign to “paint the town red.” They actually made the Phanatic red for the first week or so of the season a few years back. It was just weird. WFY: Does the latest skyscraper in Center City have a William Penn on top of it yet? Did finally installing a Joe Frazier statue break the Eagles curse? KMc: That thought has crossed my mind, but I cannot confirm if that has taken place yet or not. The city put a miniature William Penn statue on top of the Comcast Tower back in 2008, supposedly breaking the championship curse with the Phillies winning the World Series. As for the Eagles, maybe there was some Philly sports karma at play with the Joe Frazier statue. But just to be safe, I’m hoping a mini Billy Penn statue goes on top of the new Comcast building when it’s complete. WFY: How do you think the season series goes? The Fightins hold their own against DC. How do you think the NL East plays out? Until proven otherwise, I still think the Nationals hold the upper hand and take the overall season series. The Phillies are still really young at most positions and the starting pitching needs to improve around Nola and Arrieta. I think the Phillies are going to be a team that should win most of their games against the bottom half of MLB but struggle against the top third. I think despite the early struggles in D.C., the Nationals are in that top third, so in my mind they are still a significant measuring stick for where the Phillies are in their progress. I don’t like the pitching matchups for the Phillies this weekend, so I think the Nationals take a minimum of two games this weekend. The Braves are going to be a problem, as the Phillies ave learned the hard way in three series already. But just like the Mets cooled off after their hot start, I don’t think the Braves are going to run away with anything. I still think two playoff teams come out of the division, with the Nationals being one of them. As much as Gabe Kapler says his team is going to the postseason, unless they make some big moves before or at the trade deadline, I think it’s at least a year away.